Compact electric propagator featuring 10 watt heated base (lead length 132cm/52" when plug in). Ideal for seeds and cuttings. 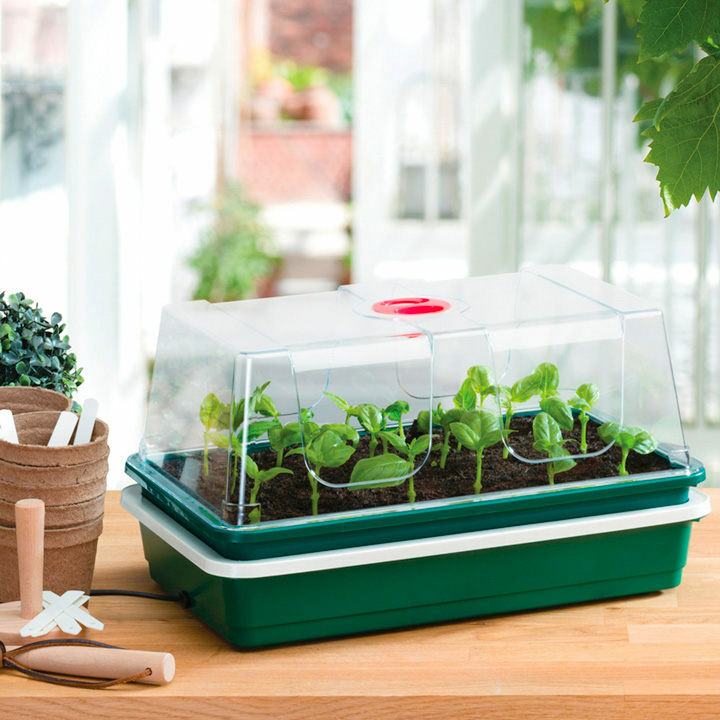 Features injection moulded growing tray and crystal clear high dome vented cover to create optimal growing conditions. Ideal for growing vegetables, flowers or herbs, this simple non thermostatic control unit provides the perfect low cost means to growing success. Economical to run, the 10 watt heated base consumes just one sixth of the power of a standard household light bulb. The electric base provides warmth which aids fast germination and supports young plant development. The crystal clear high top cover with adjustable vent enables the control of ideal humidity conditions. All components are injection moulded in rigid plastic to give many years of use. The growing tray features ‘two tier’ drainage and capillary holes which aid healthy root development while the clear cover gives a full 12cm of height clearance. With 12 FREE POTS! Size: 38.5cm (15”) long x 24cm (9.5”) wide x 20cm (8”) high.